Two of the greatest icons of the New York fashion scene are costume designer Iris Apfel and the late Bill Cunningham, legendary fashion photographer of the New York Times. Apfel, 96 years old, chronicles her extraordinary career in her autobiography Accidental Icon, and Cunningham left behind a memoir, Fashion Climbing, about the early stages of his illustrious career. 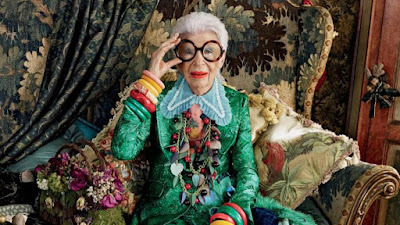 Iris Apfel is a globally revered fashion icon whose work has been celebrated at the Metropolitan Museum of Art’s Costume Institute and by countless fans worldwide. 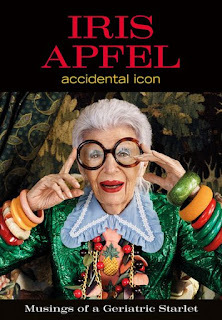 Iris Apfel: Accidental Icon might be the most colorful books you will ever own, is a unique and lavishly illustrated collection of musings, anecdotes, and observations on all matters of life and style. The ninety-six-year-old fashion icon's singular candor, wit, and exuberance jumps through the pages. There are 180 full-color and black-and-white photos and illustrations—presented in the same improvisational, multifaceted style that have made Iris a contemporary fashion icon. A woman who transcends time and trends, Apfel is a true original, one of the most dynamic personalities in the worlds of fashion, textiles, and interior design. As the cofounder with her husband, Carl Apfel, of Old World Weavers, an international textile manufacturing company that specialized in reproducing antique fabrics, her prestigious clientele has included Greta Garbo, Estee Lauder, Montgomery Clift, and Joan Rivers. Apfel also acted as a restoration consultant and replicated fabric for the White House over nine presidential administrations. Iris’s travels worldwide and a passion for flea markets of all sorts inspired her work and fueled her passion for collecting fashion and accessories. In 2005, she had the tremendous honor of being the first living person who was not a designer to have her clothing and accessories exhibited at the Costume Institute at the Metropolitan Museum of Art, a blockbuster show that catapulted her to fame and a career as a supermodel, muse, and collaborator for renowned brands, from Citroen to Tag Heuer, and global gigs at Bon Marché in Paris and the Landmark Mandarin Oriental in Hong Kong. In 2015, acclaimed director Albert Maysles released Iris, his last film—now an Emmy Award nominee—to a global audience. 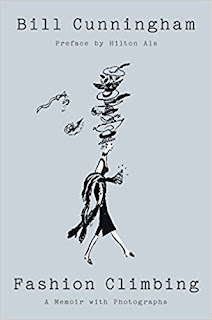 Accidental Icon is a cpativating read because Apfel gives a window into her mind through Astute maxims, lists on various topics witty anecdotes on her life from childhood to the present, and essays on style and various subjects from the decline of manners to the importance of taking risks. One of Apfel's essays is on "The Fame Game," in which she writes, "The cult of celebrity (a word I hate), is a sad commentary on our society. It's almost like as fast as technology evolves, the human race devolves. Reality shows are dreadful and allow people to live in someone else's image. You can run on your phone and follow a famous person's life almost to the extent that you are living it. Whatever happened to the cultivation of an inner self? It's painful and it's work, but it always pays off. "The obsession with the superficial reminds me of all the young ladies I went to school with who were pretty - the girls who had perfect hair, the ones who dated the football players, the prom queens. Because they were pretty, they relied totally on their looks to get along. And they didn't grow in any other way, unlike girls who looked like me, who realized they had to develop themselves in other ways to get along in the world. "To be known and admired for giving something to the planet or helping people is one thing, but for me, that's where the intrigue with fame ends. Being famous just for being famous is ridiculous; it doesn't make a person memorable or interesting. I've met celebrities and have forgotten them just as fast as hello because they had nothing much to say. There are a lot of people who are memorable to me for any number of reasons - humor, intelligence, the way they always tell a good story - and it doesn't matter to me if anyone else knows who they are." The book stands out because every page has a bold, color-filled, exciting design, which creates an imtimate feel. For example, when she writes about her mother, there are pictures of her accompanying the essay. There is a treasure trove of never-before-published personal photographs and mementos, mixed with images from top international fashion photographers and illustrators with enchanting, surprising novelties such as Disney cartoons, vintage postcards, the Iris Apfel Halloween costume for children, and more. Iris Apfel: Accidental Icon is one of the most entertaining books you will ever own, perfect for any coffee table, as it is a sure conversation starter. 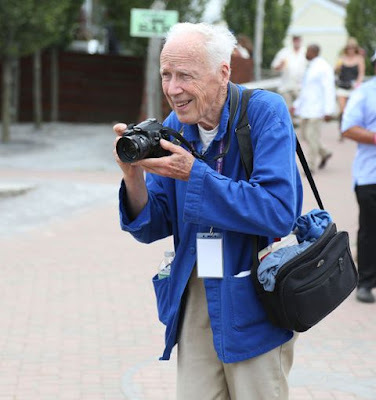 For nearly forty years, Bill Cunningham was a fixture on the streets of New York City, as he captured the style and society of his beloved city for his On the Street column in the New York Times. Cunningham was recognizable in his trademark blue jacket with a camera draped around his neck, but he was a very guarded person. He was famously private, even with his closest friends. When he passed away in 2016, his family made an unexpected discovery, two copies of a memoir he left behind. The book was neatly typewritten and carefully polished, and alongside the pages was a rough sketch of a group of fashionable woman ascending a ladder and the title, Fashion Climbing. Cunningham was born in 1929 in an Irish suburb of Boston, and Fashion Climbing begins with his childhood, where he secretly tried on his sister's dresses and when he was older, spent his evenings in the city's chic boutiques. He dreamed of living a life dedicated to fashion, despite the fact that this desire of his was a source of shame to his family. Bill was just 19 years old, dropped out of Harvard and moved to New York City to pursue a career in fashion. He lost his family’s support, but enjoyed the infinite luxury of freedom. Living on a scoop of Ovaltine a day, he would run down to Fifth Avenue to feed on the spectacular sights of the window displays – then run back to his tiny studio to work all night. Fashion Climbing captures the madcap times of his early career and the fashion scene of the mid-twentieth century. Written with the spark and wit of Holly Golightly, it is filled with Bill’s infectious joy for life. The stories are so rich with detail, it's like you could be transported back to the more dignified times when Bill was starting out, such as what he wrote on two people who loomed large for him, Nona and Sophie. "All during my fashion career, my life has been involved with Nona Park and Sophie Shonnard, two elegant members of real New York society," Cunningham wrote. "The girls started their business because Nona had just been divorced and thought it might be just the thing to get her out of her depression. They opened their first shop in 1929, after they couldn't find the kind of clothed their lives and those of their friends called for. It seems no designer really knew how elegant women lived. Most designers sat in their workrooms and dreamed of a past that had nothing to do with reality. So Nona and Sophie opened Chez Ninon, buying most of their designs in Paris and bringing them back to New York, where their superb workroom made reproductions. From time to time they hired designers of their own, but always the Paris clothes were the backbone of their collection. The shop was an exclusive club where everyone knew each other. Nona's sister-in-law, Molly McAdoo, directed the salon, and a few elegant friends down on their luck sold the clothes to more friends. The shop was an immediate success, as their formula for dressing their friends in clothes that fit their way of life was correct. Their families, though, were horrified that they had opened their shop. Their view was that young women from fine families just didn't go into business, they weren't educated for anything but the niceties of home and card games. "Chez Ninon was a name very few Seventh Avenue people had ever heard of until thirty years later, when Jackie Kennedy came into prominence. At that time, all Nona and Sophie's friends kidded them about being discovered, as the press mobs waited outside their Park Avenue shop, trying to find out what Jackie was wearing. Chez Ninon was like the Social Register of fashion; there were always as many women trying to get through its doors as there were trying to get their names pressed between the covers of the Social Register. Chez Ninon was a small business where clothes were sold not for their flashy appearance, but rather for their quiet whisper. Many people would have fallen on their heads if they could have seen Nona, Sophie, Mr. Anthony (their superb tailor), Miss Sophie (their head dressmaker, who had the patience of a saint), and me at work, putting our two cents into designing a new model." Fashion Climbing is a treasure trove for style lovers and a gift to all who seek beauty. Just as people appreciated his pictures every Sunday in the New York Times, this work should be cherished.